Even before these three fun towns get started, however, Dollywood beats everyone to the punch with the start of its winter festival season on November 4. The Dollywood Smoky Mountain Christmas features holiday music, a nightly parade of lights, and the famous Dolly’s Parade of Many Colors. Sevierville starts on November 6 with a host of events including lots of kid-friendly activities, live music, food and games. It culminates in the lights going on, and Sevierville even has lights strung along the highway from the interstate to welcome visitors. 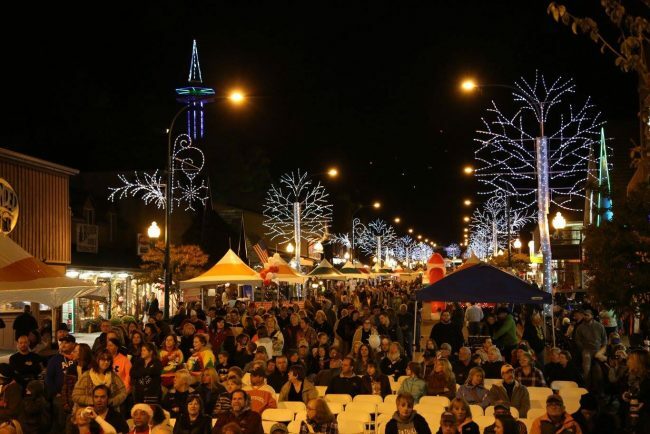 Pigeon Forge continues the good times on November 7 by switching on its more than 5 million lights in the 28th Annual Winterfest Kickoff. Old Mill Square features an enchanting display of thousands of lights built to echo the area’s covered bridges. The Smoky Mountain Opry is fully decked out for the holiday season with traditional decorations. Another unique attraction is The Island in Pigeon Forge. Here, you’ll find 40,000 ornaments and half a million lights, as well as a massive 40 foot tall Christmas tree that you can walk through. You can experience the lights of Pigeon Forge from the comfort of your car by taking the Driving Tour of Lights. Pick up a driving route brochure at one of the Welcome Centers or the Pigeon Forge Trolley Office. Pigeon Forge’s Winterfest runs from November 7 to February 28. 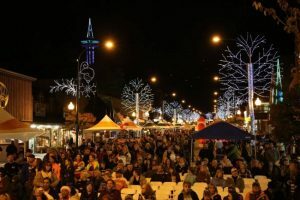 It’s a free street party (buy a $10 wristband to enjoy the samples), with live music and lighting up the winter with 3 million lights, many of them in animated displays. In Gatlinburg the Trolley Tour of Lights offers a great way to see the best light displays in town without having to drive, and still avoiding nippy winter temperatures. The route includes downtown Gatlinburg and sights along Highway 321. The Tour of Lights runs from November 8 to January 27, 2018. Gatlinburg’s Winter Magic runs from November 8 to February 28.